Containers are the latest in what are new and innovative ways of packaging, managing and deploying distributed applications. 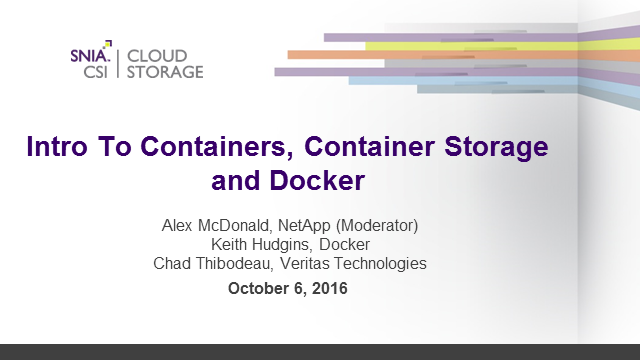 In this webcast, we’ll introduce the concept of containers; what they are and the advantages they bring illustrated by use cases, why you might want to consider them as an app deployment model, and how they differ from VMs or bare metal deployments. We’ll follow up with a look at what is required from a storage perspective when using Docker, one of the leading systems that provides a lightweight, open and secure environment for the deployment of containers. Finally, we’ll round out our Docker introduction by presenting the takeaways from DockerCon, an industry event for makers and operators of distributed applications built on Docker, that took place in Seattle in June of this year.